The pure glee on the face of a baby creating an unfathomable mess with slimy, stringy, squashy, watery combinations, originates not merely from the fact that they have created this incredible disarray around themselves - yes, that will take time and energy for us to clean up - but that they are playing, learning and discovering new things all by themselves. 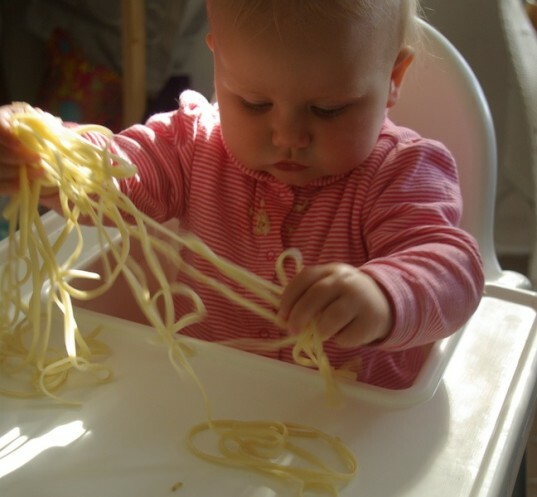 ‘Ooh, did you know that spaghetti can be spun in circles around your head? That water can’t be held in your hand? And that jello is slippery on the floor? This is fantastic!’ And with no set outcome or formula to obey, it really is liberating. Messy play is free play; using materials in new ways and therefore developing problem solving, curiosity and imagination. Our children are explorers of this world and messy play enables them to actively discover it. Messy play is all about having fun with materials with no end objective, it’s about free play and imagination, discovering how something moves and can be manipulated in new and fantastical ways. It doesn’t need to be a wild mess, I promise! 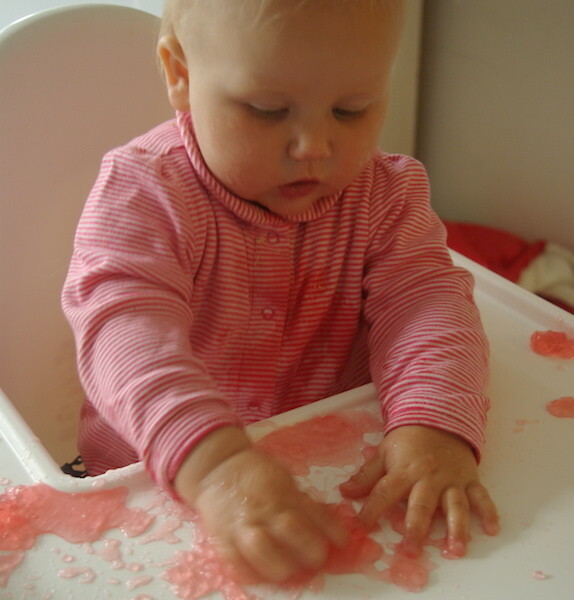 Read on for some great messy play ideas for babies. In summer it’s much easier as we can go outside. Most kids adore the beach, playing in the sand, paddling in the ocean and of course, visiting the park. Outside messy play is another great activity you can enjoy in your own space. And there’s no reason not to put down a wipe clean mat on the floor and have fun with messy play inside and all year round too! You really have to embrace it wholeheartedly, it’s not about being neat and orderly. Ways to overcome the fear of messy play being just too chaotic for your perhaps already slightly tired and frazzled nerves, are to prepare well with all messy play items ready and floor covering – wall covering too, if necessary – and leave plenty of time to tidy up. Get the kiddos to help tidy, too! 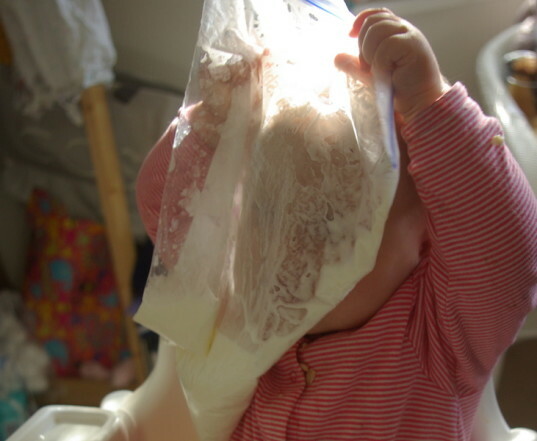 Cornflour and water – free or in a bag. Cornflour and water is a classic combination. It’s epically messy and does that thoroughly exciting thing where it’s solid squashed together upon impact and watery when left to rest. Essentially, it’s gloop, and babies love it because it’s confusing stuff. If you would rather tone it down a bit, put it in a freezer bag and it works perfectly well, like a squishy, mystifying blob! Empty plastic bottles filled with rice, pasta and beans. Each of the bottle’s contents makes a different sound when shaken. 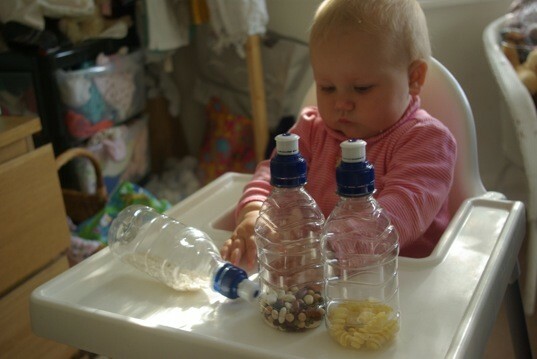 Babies can wiggle them around, knock them down like skittles and spin the bottles in their hands, looking at the pretty contents moving around! You could also fill with water and glitter for a little party bottle. Blobs of set jello. All cold and slimy, just pop it in your baby’s hands and watch them wibble wobble it around, before splat! They can have a little taste of it if they like – as we all know how much babies explore using their mouths as a sensory device – and of course you can buy vegetarian jello. 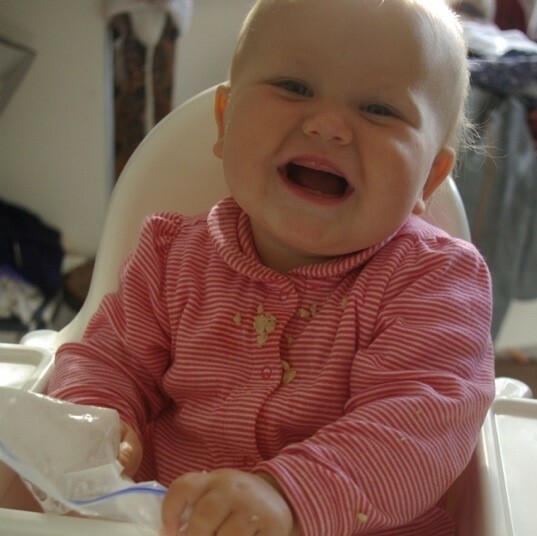 Babies can be free to roam with the jello, or in their high chair, like Alba is here. Splashing in the bath outside. Just pop your baby bath under the shade of a tree and half fill it with water. While the weather is still warm, this is great; babies are free to truly embrace the outdoors, splash around to their heart’s content and cackle with joy! 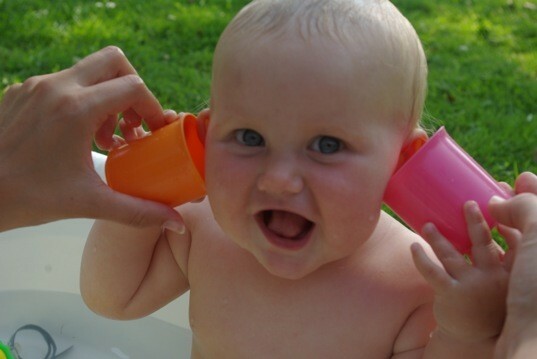 Of course, always supervise your baby during water play to ensure safety. Cooked and drained spaghetti, made slimy with a cup of fresh, cold water. Swinging the long and cold string over their heads, submerging their hands into the long, wriggling worms from space! Amazing fun for babies. Whatever you decide to do, jump right into the space worms, squish those slimy blobs that fall from special oak trees and shake the bean rattle to the dance of the meerkat – imagination is a wonderful thing. And don’t wince at the mess. 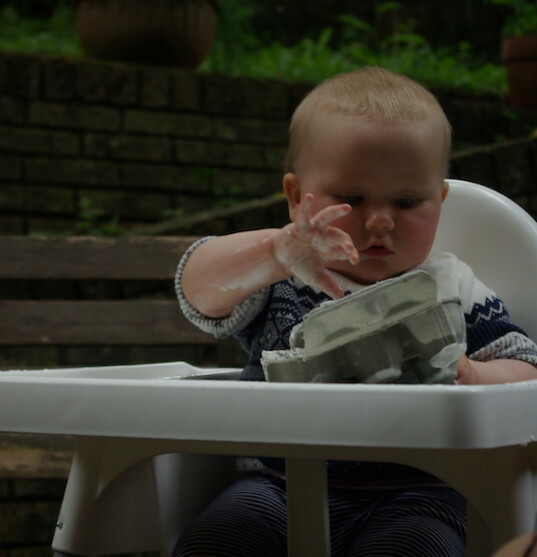 There will be so much sensory excitement going on for your baby and it really is a joy to see them so utterly delighted. Clearing up can come later. Have fun now! RELATED | 20 Educational And FUN Sensory Table Activities For Kids! Cornflour and water - free or in a bag. Cornflour and water is a classic combination. It’s epically messy and does that thoroughly exciting thing where it’s solid squashed together upon impact and watery when left to rest. Essentially, it’s gloop, and babies love it because it’s confusing stuff. If you would rather tone it down a bit, put it in a freezer bag and it works perfectly well, like a squishy, mystifying blob! Whatever you decide to do, jump right into the space worms, squish those slimy blobs that fall from special oak trees and shake the bean rattle to the dance of the meerkat - imagination is a wonderful thing. And don't wince at the mess. 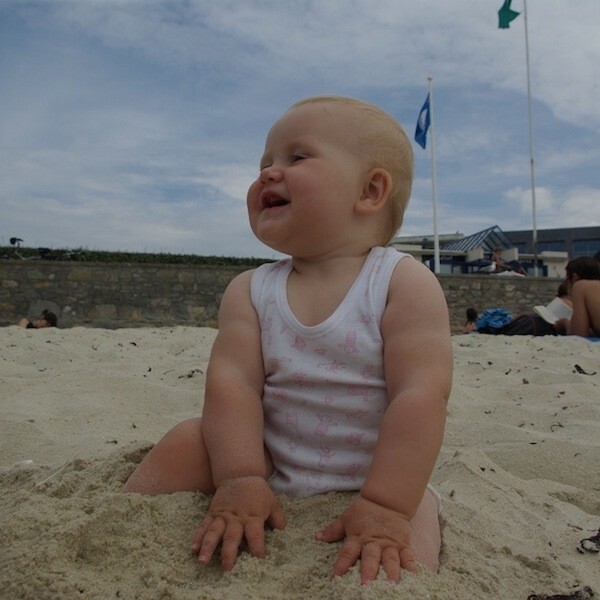 There will be so much sensory excitement going on for your baby and it really is a joy to see them so utterly delighted. Clearing up can come later. Have fun now!